Venerable Metteyya was born in the same place as the Buddha: Lumbini, Nepal. At age 15, Ven. Metteyya and some dedicated friends began building Metta Schools. The 2 schools now provide education to nearly 900 students and encourage many young volunteers to spread the gift of education to Lumbini’s children. Ven. Metteyya, now 27, co-founded Peace Grove Institute and is a strong advocate for women’s education, equality and excellence in Nepal. He is the co-founder of Karuna Women’s Institute and Girls College and Anatta Children’s Library, and Bodhi Institute and Peace Education Centre. He is the Spiritual Guide of CEBA in Edmonton, Canada. Venerable Metteyya is a much loved Buddhist teacher in both Nepal and in the west. His enthusiasm to practice and demonstrate compassion in action has been a true source of inspiration for all who have met him. Though his formal training is in Theravada Buddhist tradition and Vipassana, Venerable Metteyya has acquired precious teachings from various masters of Tibetan Buddhism and studied with the Vietnamese Pure Land tradition. He also holds a BA in Buddhist studies. Ven. Metteyya was one of the featured scholars in the 2010 PBS film ‘The Buddha’ by David Grubin. The Lumbini Social Service Foundation is a nonprofit organization founded and managed by the local Lumbini community whos mission is to put compassion and wisdom into practical action, to help create better communities. To address the root causes of poverty, illness, and social inequality, LSSF works in various strategic areas. The holistic approach to development is anchored in education, but has outreaching affects in health, environmental conservation, and women’s empowerment. In all of our work, our goal is to put compassion and wisdom into practical action, to educate and improve our local community for the benefit of all. Global Karuna is a branch of the Lumbini Social Service Foundation (LSSF), a grassroots level organization focused on providing education to rural, underprivileged children in Lumbini, Nepal. After the earthquake of April 25th, founder Venerable Metteyya called upon his volunteers and supporters to contribute to this important humanitarian cause. Global Karuna was thus born out of a desire to serve and support the victims of this natural disaster with compassionate action. As a new operation, Global Karuna has grown and adapted rapidly to meet the needs of earthquake survivors. From day to day, and week to week, the needs of the Nepali people and their villages have changed, and so have our methods and the relief supplies we’ve provided. While initial days and weeks focused primarily on water and food supplies to all affected areas, subsequent weeks focused on more remote areas and supplies for shelter. Looking forward, the focus continues to shift toward long-term reconstruction projects. Projects such as Namuna Gaun and Gompa Lungdang seek to utilize local natural and human resources to rebuild sustainably and in an eco-friendly manner, but also to preserve the unique and diverse cultural heritage of Nepal’s villages. Guruma Bodhi is an ordained Buddhist nun, president (and resident teacher) of CEBA, and co-founder of Peace Grove Institute (Nunnery and Girls College). Bodhi has volunteered, studied and practiced Buddhism in several countries on many occasions including intensive meditation retreats and spiritual pilgrimages. She is also an environmental scientist, employed at Environment Canada, working in environmental protection. She previously founded Elephants in Nedd, has served on the board of directors at the Valley Zoo, Vegetarians of Alberta, and was a master composter and recycler with the City of Edmonton. She is Venerable Metteyya's Dharma mother, supporting his material needs so that he is free to work on his spiritual path and social work activities, with full faith in his vision and ability. Canadian Engaged Buddhism Association (CEBA) is a small group of dedicated volunteers seeking ways to apply the insights from meditation practice and Buddha’s teachings to help relieve suffering and injustice. Individual member’s efforts and initiatives locally have focused on relieving animals suffering and environmental causes, while globally, as an organization, have been supporting the “Metta Family” of projects in Lumbini, Nepal since CEBA’s inception through fundraising, awareness events, organizing meaningful “holidays” and volunteering. In Kathmandu, Steve overseas the running of the Himalayan Children's Foundation, which educates underprivileged and orphaned children from remote mountain districts. In Bhutan, he is involved with a project that supports a family-run traditional art school outside of the capital, Thimphu. 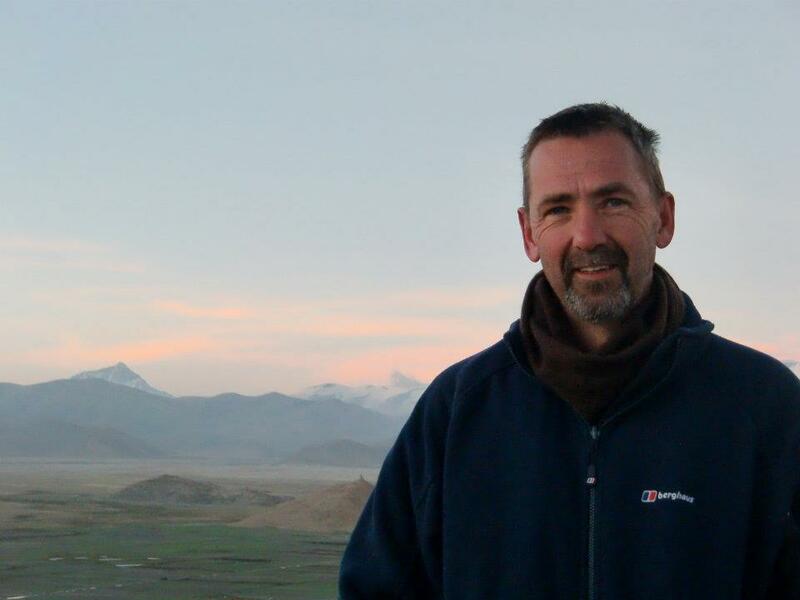 Steve has also guided journeys in Tibet, including the ethereal setting of Rongbuk Monastery below the North Face of Everest. Steve originally travelled to Nepal on holiday and never left. Health Foundation Nepal is a charity organization which aims to provide financial support and technical expertise to the hospitals and local organizations, which promote community health, conduct health research and provide health care services in rural and under-served communities of Nepal. It is supporting basic health care services by promoting the concept of community based comprehensive primary health care. People residing in rural communities of Nepal are still struggling to get primary health care services. They face the issues of availability, accessibility and affordability of health services provided by the governmental and private sectors. With great enthusiasm, a group of physicians residing in the United States began preliminary discussions in early 2012 (late 2067 BS) about how they can contribute to improve the health of under-served communities of Nepal. More than a dozen physicians and other interested professionals, with interests in both clinical practice and community health, formed a group with the goal of promoting rural health in Nepal. Childlife is a grassroots organization located in northern Thailand in the city of Mae Sai, near the Burma border. Childlife, or Baan Nanain Thai, founded in 1999, provides direct intervention for at risk children. It is a non-religious, non-governmental organization which cares for all children in need, regardless of ethnicity, nationality, or religion. Childlife currently provides emergency and long-term shelter, education, medical care, food and clothing for 140 children. Through these services the staff works to prevent criminal activities and the exploitation of children. For several years Anatta organized and implemented two-day medical clinics for the children of Baan Nana, hiring local doctors and nurses assisted by medical volunteers. Anatta psychologists and social workers conducted social histories with each child with the aid of local staff and professional translators. Full report of the medical clinic outcome statistics was generated for use by the Childlife staff. Based on the outcome of the clinics, medicines and treatment were provided as needed. Given the dire need of the children, the severe insufficiency of funds and the dedication of the local staff, we would like to conduct further educational projects with Childlife including an ongoing health and hygiene awareness program and HIV/AIDS screening and education. We are currently researching these possibilities with local assistance.